Cucumbers are in your shopping cart occasionally, right? Well here are 8 reasons to add cucumbers to your diet more often. 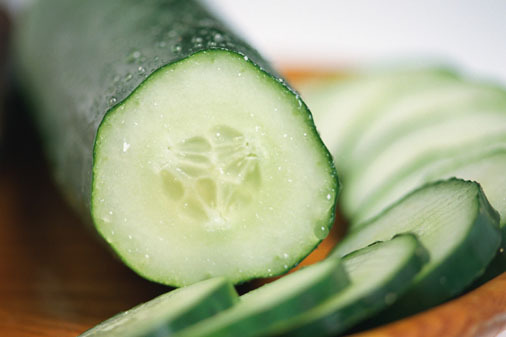 Alkalize your body: Cucumbers are one of the top green veggies to help keep your body in an alkaline state. If your body is in an alkaline state, disease will be unable to grab a foothold. Remember, fruits and veggies and minimal meat and dairy. Vitamins: You may be surprised to learn that cucumbers actually contain some great vitamins and minerals such as Vitamin B1, B2, B3, B5, B6, Folic Acid, calcium plus loads of potassium, magnesium and zinc. Cucumbers actually help provide many of your daily vitamins. secoisolariciresinol, lariciresinol and pinoresinol. These are 'plant lignans' and there is recent evidence to suggest that these lignans help reduce cardiovascular problems and hormone associated cancers (breast, uterine, ovarian, and prostate). Arthritis and Gout: Cucumber is an excellent source of natural mineral silica that promotes joint health by strengthening connective tissue. Cucumber lowers level of uric acid in your system which can help relieve arthritis and gout pain. Hair and Nails: The wonderful mineral silica, contained in cucumber, is also a boon to your hair and nails. It makes nails stronger and hair shinier. Eliminate Toxins: Since cucumbers contain a lot of water, it is like a little broom cleaning away the waste products out of your body. Eating a lot of cucumber will help dissolve or keep kidney stones at bay. Weight Loss and Digestion: Cucumbers have a high water content and lower calorie count so they are an ideal source for people who are dieting. Use lots of cucumber in your salads or munch on cucumber sticks with low calorie dip. The fiber in cucumber is great for your digestion. Cholesterol: Researchers have found that sterols help decrease cholestrol levels. Guess what? Yup, cucumbers contain sterols to help lower your cholesterol. Who knew! Cucumber is an easy 'green' to add to your life. I love cucumber salad and make it every week. It's quick and easy. Now I'm going to add cucumber snacks to my lunches. How about you? Shred cucumbers (slice paper thin) and add salt. Let drain in colander for 5 minutes. Mix yogurt, vinegar, sugar together. Add cucumbers and dill. Toss and serve chilled.